Red onion, lemon, capers, and dill are traditionally served with lox, cream cheese, and bagels. Here we've turned these tasty ingredients into the ultimate party appetizer. 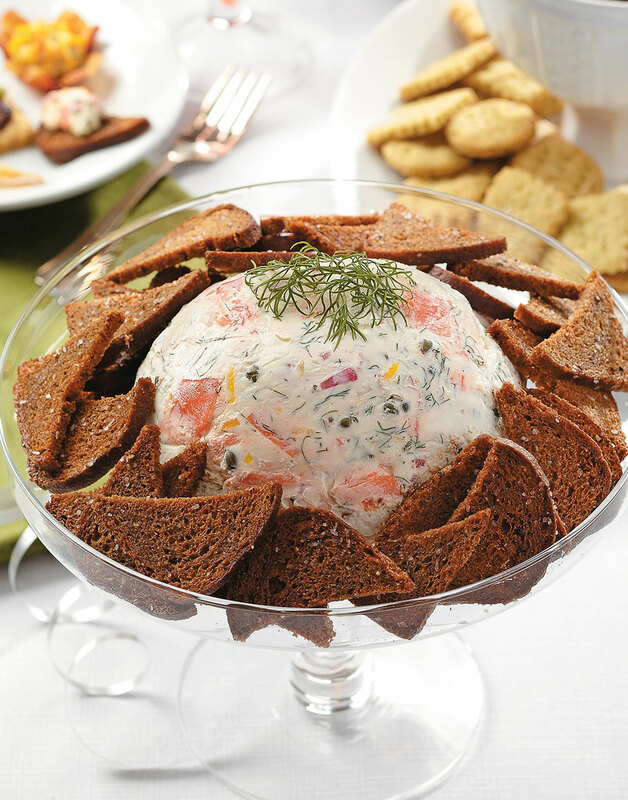 This Smoked Salmon Cheeseball served with rye cocktail toasts can (and should) be made ahead, plus it makes enough that you won't have to worry about running out, or having to replenish half way through the party. Cut rye cocktail bread into triangles, lightly brush with oil, season with salt and pepper, and toast in a 350-degree oven before serving with this dip. Line a bowl with plastic wrap; set aside. Beat cream cheese, onion, chopped dill, zest, lemon juice, capers, and caper liquid in a bowl with a hand mixer until combined; season with salt and pepper. Fold salmon into cheese mixture, then spoon mixture into prepared bowl and cover with plastic wrap. Chill cheese ball until firm, 2 hours. Top cheese ball with dill sprigs and serve with rye cocktail toasts.